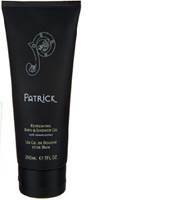 Patrick Bath and Shower Gel is a rich and daring scent. The one you remember from the generations long fame of it's Patrick After Shave colonge / after shave. With fresh green notes of fern and pine, warmed with the woody notes of oak moss and patchouli you will love this easy to use shower gel. The bottle and box design features a design based on one of the greatest examples of Celtic Art - the Book of Kells - rich in texture and symbolizing the leather bound cover of the great book. Patrick is named in honor of Ireland's patron saint who arrived on Irish shores in the 4th century A.D. The fragrance is inspired by his journeys across the length and breath of the island, across the vast native forests that blanketed the landscape, the rich green pastures and rocky coasts.